Ontraport was founded in 2006 by Landon Ray as a platform meant to enable and assist entrepreneurs and small businesses. Motivated by his own entrepreneurial experience, Ray devised the Ontraport software suite as a combined sales and marketing platform with ecommerce, automation and reporting tools. Since its inception, Ontraport has won accolades for their small business focus and company growth. In 2012, they were listed as #102 on the Inc. 500. The company currently has revenue over $10 million and over 100 employees. Ontraport is headquartered in Santa Barbara, California, with Landon Ray serving as CEO. No; however, Ontraport offers a 90-Day Money Back Guarantee. Ontraport offers three subscription tiers. There are no long-term contracts — the account is billed at the monthly rate for the first 90 days, after which it becomes eligible for annual pricing with an 18% discount. Subscriptions can be upgraded from within the account; upgrades or downgrades will see account changes reflected immediately with pricing reflected in the next billing cycle. 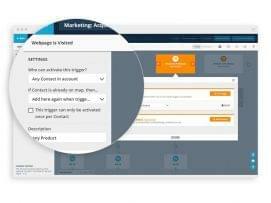 Ontraport offers combined sales and marketing features for entrepreneurs and small businesses. The platform offers tools for content generation, digital marketing, traditional marketing (direct mail), ecommerce, automation and general CRM tools like contact, task and schedule management. There’s a lot to like in the platform — it offers lower rates than other combined sales and marketing solutions, though it also allows a fewer number of users. (The fees for additional users would push Ontraport above the nominal price point of its competitors.) Ontraport also allows for some flexibility in its subscriptions — accounts can add as many users as they desire, pay month-to-month if they choose, enjoy a higher allotment of contacts and monthly emails than in competitive solutions and, for the Pro and Team plans, enjoy a free two-hour phone onboarding session in which Ontraport client success staff set up basic automations on your behalf. It’s a nice perk. So what can the platform help you do? Ontraport provides content management tools for publishing and tracking — users can integrate WordPress accounts directly into Ontraport and display Ontraport-designed pages to their WordPress sites. It also offers a design interface and template library for landing pages, emails, and postcards (for a more personal touch). The correspondence can be configured as email marketing, direct mail promotions, customer notifications, reminders and confirmations, etc. The CRM organizes contacts, leads, organizations, opportunities, tasks, activities, and so forth; each contact interaction is recorded and presented along with pertinent lead information and engagement history. Lists can be segmented for bulk action or edits based on built-in or custom criteria. 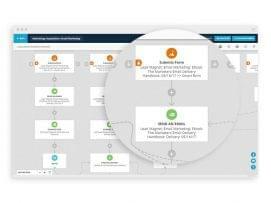 Users can build automations based on ‘if/then’ criteria to automate task creation, record updates, follow-ups with customers, data collection for fulfillment lists, etc, within separate user-defined sequences. 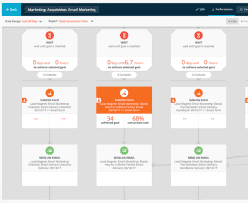 These sequences also refer to Ontraport’s automated engagement tools in which users can create a series of triggered actions to personalize lead nurturing and manage the client experience. 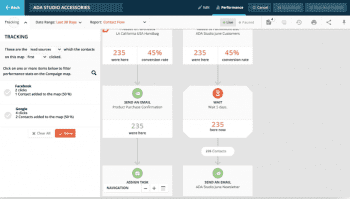 Qualified leads can then be distributed to your sales team using default — Round Robin or Weighted Random — or custom rules. Users can also create and manage an online storefront for online sales, payment management and storage of customer orders within a single system. Users can customize order and upsell forms, manage shopping cart functionality, coupon code functionality, payment gateways and security. Ontraport also provides custom reporting dashboards (in the Pro and Team plans) that presents company date according to user specifications. The dashboards are easily rearranged through a drag-and-drop interface. 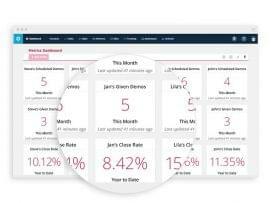 Users can also create custom metrics and present them on their dashboards. Ontraport provides a fairly wide range of robust small business tools, particularly for entrepreneurs selling products in an online storefront. Currently, its range of extensions is smaller than competitive solutions, but its recognition and growing user base suggest Ontraport’s customers are satisfied with the flexibility, features and individual attention the company provides. What Do You Think of Ontraport?